It is possible to repair a window temporarily by using a sheet of polythene fixed to the inside of the window with adhesive tape or nailed lightly on with battens. But sooner or later you will have to replace the glass. How you do this depends on whether the window is timber or metal. Most of the glass pieces (which will be sharp) should pull out easily. If the glass is held in by putty, this will have to be chopped out with a screwdriver or old chisel or with a glazier’s hacking knife. With wooden windows, the old glass will probably have been held in place with glazing sprigs -these should be removed and discarded. If the glass was held in place with bead­ing, this should be removed carefully by prising it up at the centre of the longest sides. Glass in metal windows is held in place with metal clips. These should be removed carefully and saved for reuse -mark their position on the window as you take them out. When all the putty has been removed, brush out all the dust and debris and apply a coat of primer – wood or metal, as appropriate. 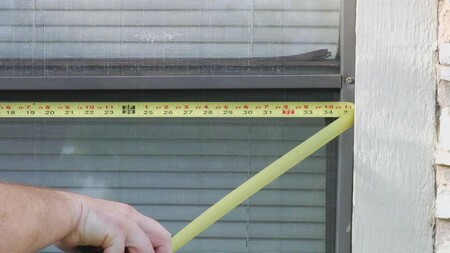 It is important to measure the rebate accurately so that the glass is the right size. Take at least three meas­urements in each direction to the nearest millimetre. If these are slightly different (by a few millimetres) do not worry use the smallest size. The piece of glass you want is 3mm less in either direction than your measurements – to allow for slight movements in the frame. Check the window for squareness by measuring the diagonals. If it is badly out (or opposite sides are very different) you will have to make a template out of card to take with you to the glass merchant. You will also have to do this if the window is an unusual shape. If the window is remov­able, take the whole thing. Take the old glass with you for the glass merchant to dispose of it is not a good idea to put it in the dustbin. When replacing patterned glass, it helps if you can show the glass mer­chant the exact pattern you are replacing – make a note of which way the pattern runs. Buy the thickness of glass appropri­ate to the vulnerability and size of the window. The glass merchant will prob­ably sell the other things you need: lin­seed oil putty and glazing sprigs for wooden windows; metal casement putty and clips for metal windows. First make a check that the new pane is the right size. Knead a ball of putty in your hands until it is soft and pliable hard linseed oil putty can be softened by adding more linseed oil. Press a continuous layer about 3 to 5mm thick all the way around the rebate with your thumb, pressing it well into place. Lift the new pane of glass carefully into place, bottom first, allowing an expansion gap at the bottom, about the thickness of a matchstick. Push the glass, gently but firmly, against the putty: press at the edges, never at the centre. This should push some of the putty out, but leave about 2 to 3mm behind the glass all the way around. Now hammer the sprigs into the window so that one edge holds the glass in place use a glazier’s hacking knife (or the edge of an old firmer chisel) to tap the sprigs home by sliding it along the surface of the glass. Using a hammer is likely to break the glass. When all the sprigs are in place (or clips replaced with metal windows), run another layer of putty on the outside of the glass and finish it off at an angle to allow water to run off: the best tool for this is a putty knife. The corners should be mitred look at your other windows to get the angles right. Any putty which has been squeezed out on the inside of the window should be cleaned up, too, leaving a slight angle to allow condensation to run off. When fitting or replacing wooden beading on the outside, you need less putty between it and the glass, and the beading should be held in place with panel pins. Remem­ber to prime new beading before it is fitted. When the putty is neatly finished, run over it with a moistened paint brush to make sure that it adheres firmly to the glass. It has to be left for a week or two before it can be painted – if you paint it too soon or too late, the paint will crack. Carry the paint line just over the edge of the putty to prevent water get­ting in. Putty smears on the window pane can be removed with a cloth moistened with methylated spirit.